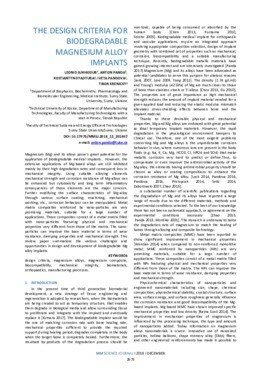 Magnesium (Mg) and its alloys posse’s great potential for the application of biodegradable medical implants. However, the extensive applications of Mg-based alloys are still inhibited mainly by their high degradation rates and consequent loss in mechanical integrity. Using suitable alloying elements mechanical strength and corrosion resistance of Mg-alloys can be enhanced but cytotoxicity and long term inflammatory consequences of these elements are the major concern. Further modifying the surface characteristics of Mg-alloy through various surface coating, machining, mechanical working, etc., corrosion behaviour can be manipulated. Metal matrix composites reinforced by nano-particles are very promising materials, suitable for a large number of applications. These composites consist of a metal matrix filled with nano-particles featuring physical and mechanical properties very different from those of the matrix. The nano-particles can improve the base material in terms of wear resistance, damping properties and mechanical strength. This review paper summarises the various challenges and opportunities in design and development of biodegradable Mg alloy implants.